Click here for Jacobi action. With eleven events over three years under our belt, including the UK premiere of Spring Breakers, we're taking a breather for the foreseeable. The world's foremost Brian Blessed expert joins the podcast for a movie trivia special. A long-term project assessing the relative merits of every movie featuring HRH Hugh Grant. An irregularly updated list of the year's best movies. Previous lists: 2012, 2011, 2010, 2009. Find out more about the Ultra Culture lifestyle. Read some lovely things written by people with nice hair. Discover how you can help us sell out. Throw your thoughts and feelings in here. Because only a fool could dislike a good QR code. I can’t tell you anything about Hitchcock — the upcoming Sacha Gervasi-directed Alfred Hitchcock biopic that, whatever else, will retain the title of 2012’s Best Trailer — just yet, because it’s embargoed for another few weeks here in the UK, but I will say this: it’s not The Girl. 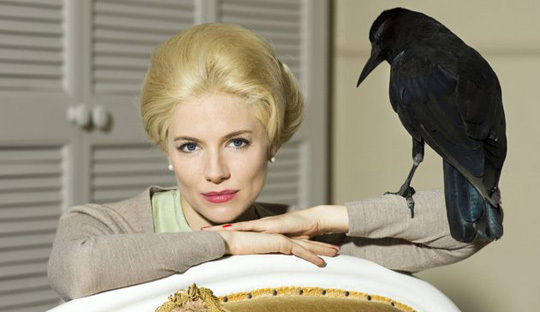 Julian Jarrold’s rival portrait of the portly director takes place during the three years in which he worked with Tippi Hedren — first on The Birds, and then Marnie. Unlike Gervasi’s film, The Girl offers almost nothing in the way of reverence to its subject, painting him instead as a cruel, vindictive man overwhelmed by sexual frustration. The facts have to be taken with a pinch of salt — this version of events is taken almost entirely from interviews with people inclined to dislike the director, including spurned screenwriter Evan Hunter and Hedren herself — but at least this rendering of Hitchcock has some life to it, even if it’s not necessarily the one he led. Needless to say, Toby Jones (who must be getting used to being overshadowed by inferior but bigger-budgeted identi-biopics) leaves Anthony Hopkin’s wink-wink, nudge-nudge caricature of a performance in the dust.